By the time we were done, more than 100 people would've touched the process across more than 600 individual steps. The network cables alone cost us more than $ 80,000 (we would have a minimum footprint of 400 servers). We thought it was worth it, but it was a really big effort. Organizations of all sizes are deploying encryption to meet data security compliance requirements, protect intellectual property, and secure their customer’s personally identifiable information. Syncsort’s latest eBook, “IBM i Encryption with FieldProc and Alliance AES/400,” explores the architecture, implementation, critical features and limitations of Field Procedures on the IBM i and points to some solutions to the primary challenges. IBM introduced a Db2 database column level exit point named Field Procedures, or FieldProc, in release 7.1 of the IBM i operating system. This column-level exit point is implemented directly in the Db2 database and is invisible to applications that use that database. Marty Balin of Jefferson Starship died yesterday. 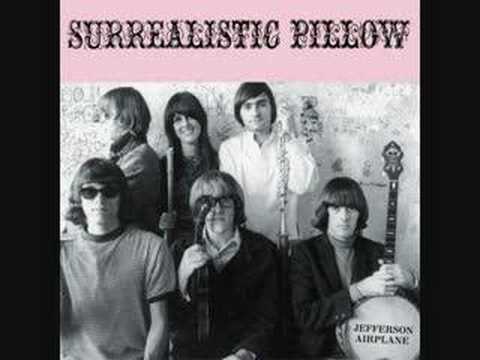 Marty Balin, co-founder of the psychedelic rock band Jefferson Airplane, has died. He was 76. Balin and guitarist Paul Kantner first formed Jefferson in San Francisco in the mid-1960s, at the height of the psychedelic rock era. Kantner died in 2016 at age 74. Later in his career, Balin, Kantner and Slick teamed up again for the band’s successor group, Jefferson Starship. He left the band in 1978. In 2016, the late singer underwent open-heart surgery, the New York Post reported at the time. Balin later sued New York’s Mount Sinai Beth Israel Hospital, claiming the hospital ruined his musical career with a botched tracheotomy following the surgery. Besides Susan, Balin is survived by daughters Jennifer Edwards and Delaney Balin, and stepdaughters Rebekah Geier and Moriah Geier. 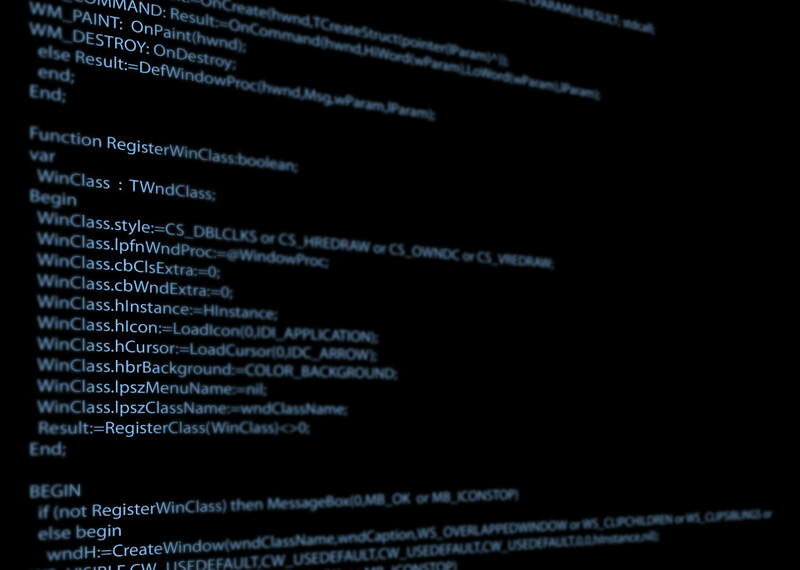 Azure Machine Learning has continually improved and developed, and Microsoft has consistently ensured full integration with Microsoft Dynamics 365. This provides tremendous benefits to all types of business. Specifically, it provides text analysis capabilities for case attributes, identifying the most effective KB articles. 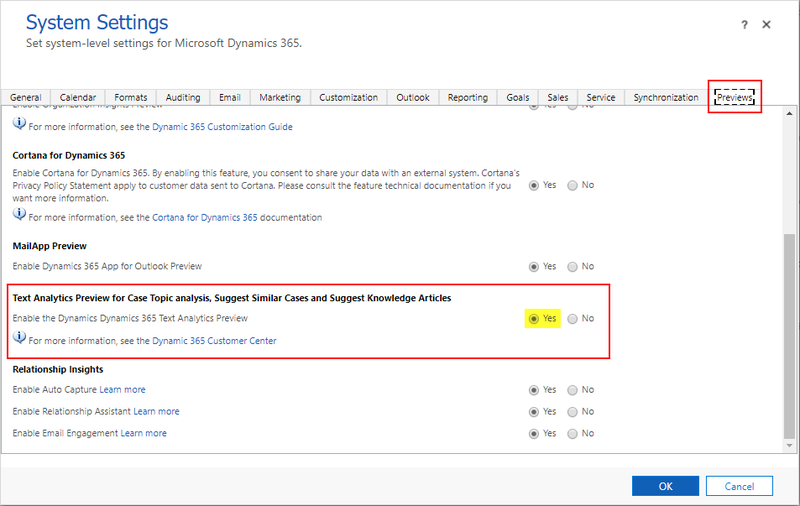 The following will help you configure Dynamics 365 for Sales/Customer Engagement (CRM) text analysis with Azure Text Analytics Service. 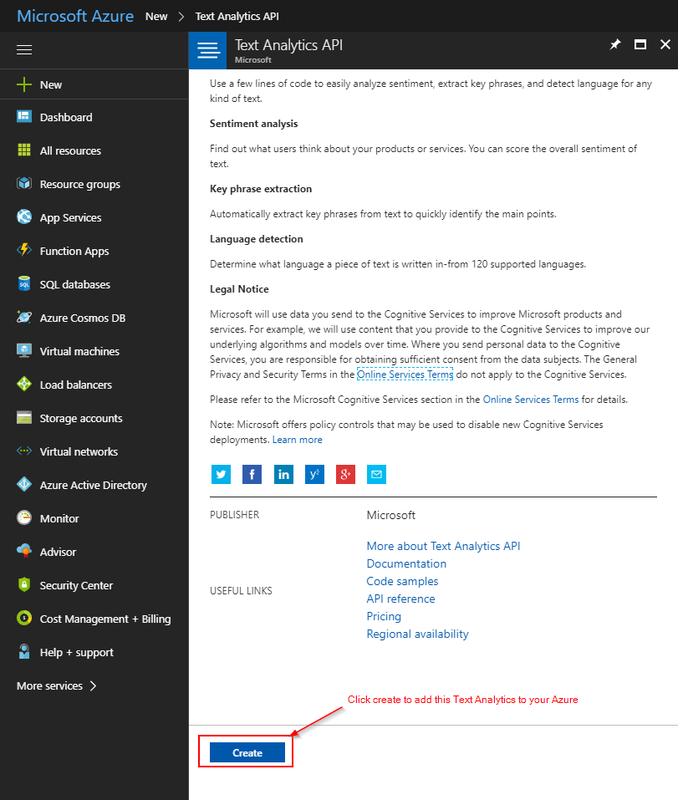 Add Text Analytics to Azure. 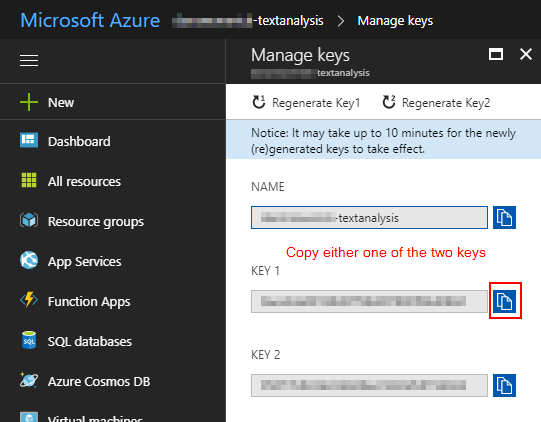 Copy Endpoint and Key as in the images below. 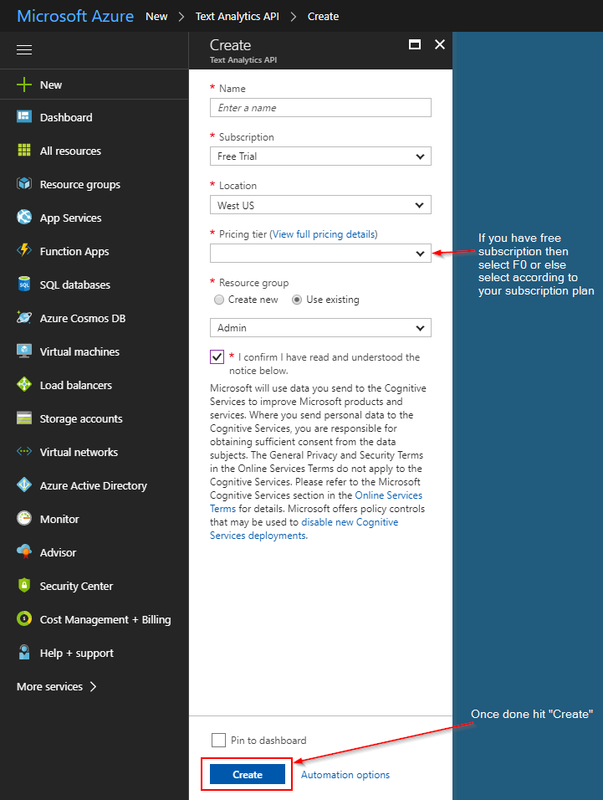 After configuring Text Analytics in Azure, Machine Learning Text Analytics can be configured in Dynamics as follows. 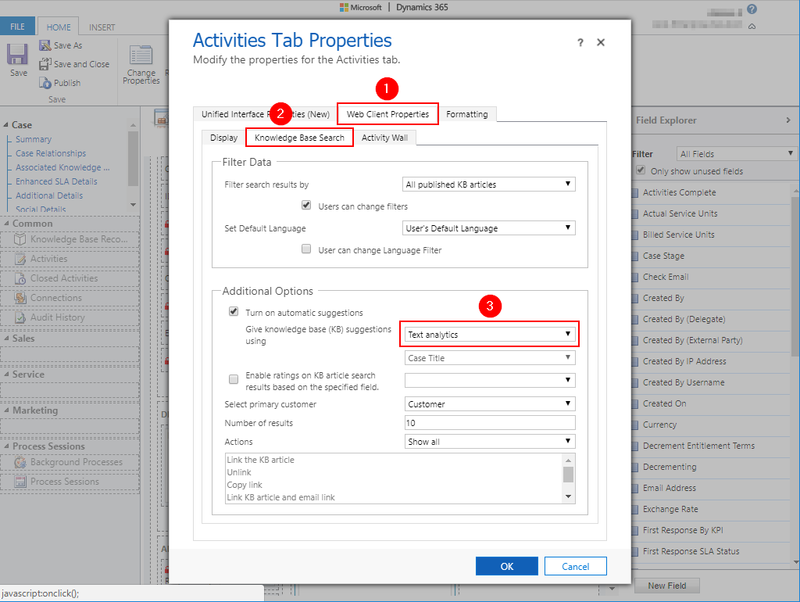 Text Analytics service in Dynamics has now been configured. It’s now capable of suggesting similar appropriate cases or KB Articles. 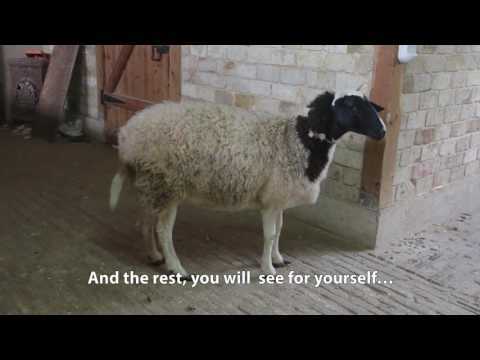 The following demonstrates how to use this for KB article suggestions. Behavior can be reviewed once this is completed. In the example, the same case is used but the Maximum number of key phrases in Knowledge Search Model has been modified. Initially, it was set to 2; it is now set at 10. For questions or more information about working with Microsoft Dynamics 365, please contact the experts at AKA Enterprise Solutions. Since the release of the Power BI Premium Capacity Metrics app last month (blog post August 2018), we’ve been working hard making improvements in the layout and metrics. 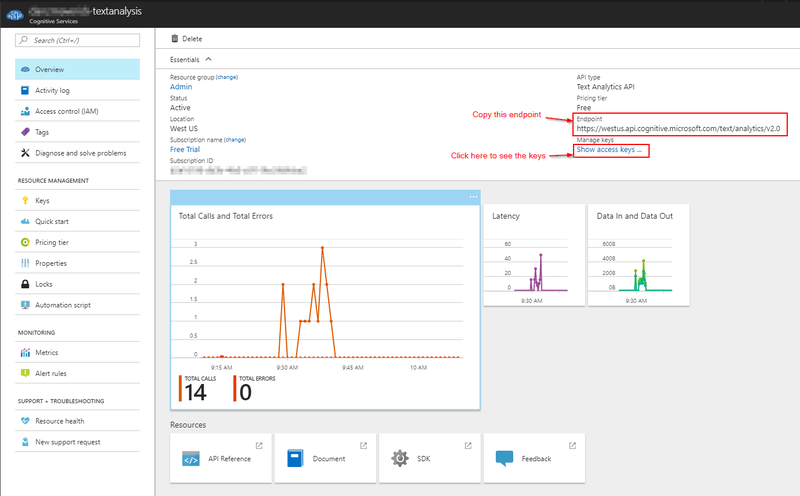 We’re excited to share the new look and feel of the app and announce the availability of new metrics for monitoring queries running on a capacity. 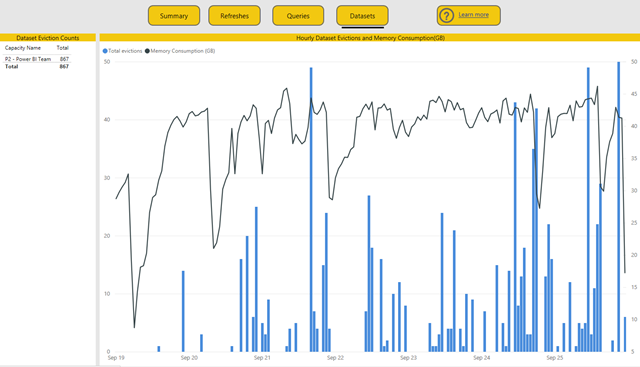 Query metrics along with existing comprehensive view of datasets refreshes, dataset evictions and system metrics, provide a more in-depth and complete picture of the capacity’s overall health. 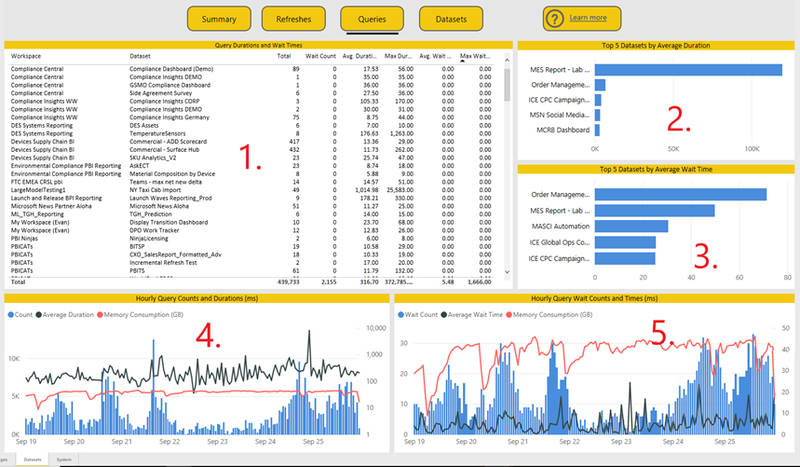 This app enabled Power BI admins and capacity admins to make informed, data driven decision in-order to make the best use of the capacity. 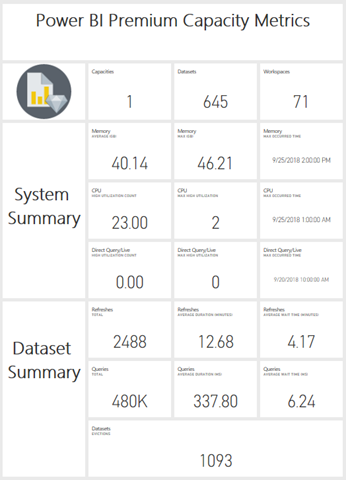 The report within the Power BI Premium Capacity Monitoring app has been updated with new navigation. The number of pages have been simplified to just three. Filters applied to all pages – Allows you to optionally filter the other pages in the report to a specific capacity. Datasets – Provides detailed metrics on the health of the datasets within your capacity. 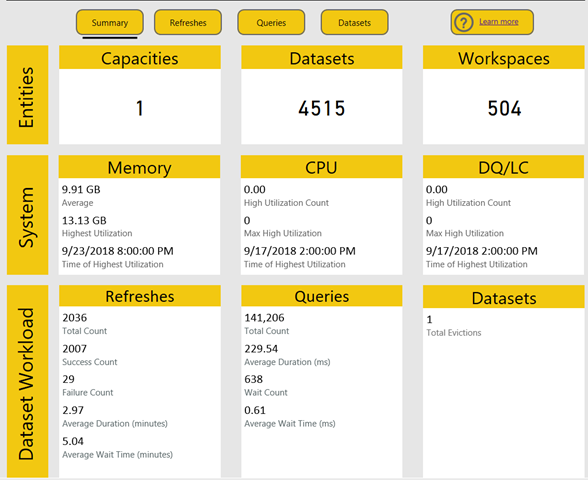 System – Provides overall capacity metrics including memory and high CPU utilization. On the datasets page itself, new bookmark navigation has been added to the top enabling you to switch between the different datasets metrics. 1. The total number of queries run, total number of query wait count for Live query/Direct query, average/max query duration in milliseconds, average/max query wait time in milliseconds sliced by dataset, workspace and hourly buckets for the past seven days. 2. Lists the top five datasets by the average query duration in milliseconds. 3. Lists the top five datasets by average of query wait time in milliseconds. Query wait time is the time between when a query was supposed to start and when it did start. Long query wait times can occur under high CPU utilization or when waiting for evictions to complete. 4. Shows the query counts, average duration (in ms) vs. memory consumption in GB split into one-hour buckets reported in local time. 5. Shows the query counts, average wait time (in ms) vs. memory consumption in GB split into one-hour buckets reported in local time. Long query durations and long wait times could be a sign that a capacity running hot. It may also mean that the datasets themselves could benefit from optimizations and further investigation is needed. Let’s get started by installing the service app. If you have a previous version of the app already installed, it’s best to delete it from your apps and then hit refresh to avoid confusion with versions. 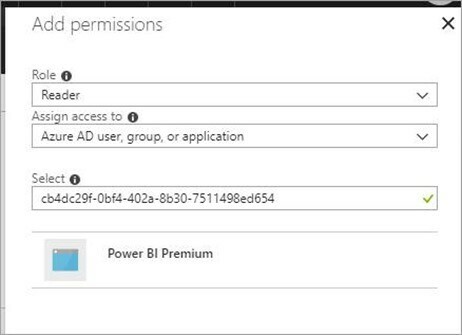 Learn more about what Power BI premium is, managing premium capacities and how Power BI Premium works. Check out "Deploying and managing Microsoft Power BI Premium capacities to your entire organization" session from the Microsoft Business Application Summit to see how to use these new reports. In the end, LinkNYC — a plan proposed by consortium CityBridge — secured a contract from the city, beating out competing proposals with electricity-generating piezoelectric pressure plates and EV charging stations. The plan was to spend $ 200 million installing as many as 10,000 kiosks, or Links, that would supply free, encrypted gigabit Wi-Fi to passers-by within 150 feet. They would have buttons that link directly to 911 and New York’s 311 service and free USB charging stations for smartphones, plus wired handsets that would allow free calls to all 50 states and Washington, D.C. And perhaps best of all, they wouldn’t cost the city a dime; advertising would subsidize expansion and ongoing maintenance. In April, it teamed up with the New York City Council to roll out Participatory Budgeting New York City, which let residents as young as 11 vote via the kiosk tablets on how the city will allocate its $ 40 million public budget. And it launched an awareness campaign to get New Yorkers registered to vote in advance of the November 2018 general elections. (The latter integrated with the city’s voter registration data to show a real-time count of the number of people signed up.) It also posts Community Board meeting notices and local road closures and through its LinkLocal program lets small businesses advertise for free on select kiosks around the city. Revenue, meanwhile, has missed expectations. Over the first two years, the city collected $ 43.4 million in payments, narrowly beating the $ 42.5 million minimum CityBridge guaranteed. Under an amended deal, CityBridge will delay paying the city its share of revenues (above the minimum payments) until the last year of the contract, when they’ll be due with 10 percent interest. None of this has scared away investors, who extended $ 150 million in financing to Intersection last year.